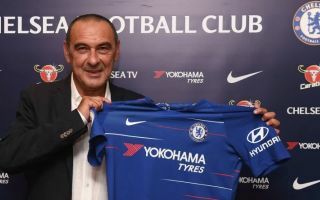 Maurizio Sarri is officially the new Chelsea manager and signed a three-year contract at Stamford Bridge this morning, according to Sky Sports. The former Napoli boss was widely tipped to take over at the Stamford Bridge helm, and the deal was finally confirmed a day after former manager Antonio Conte left the club. Furthermore, as per the report from Sky, Chelsea legend Gianfranco Zola will be appointed as his assistant. In what started as a very quiet summer for the Blues, the ball is definitely starting to get rolling as Napoli midfielder Jorginho is also expected to join Sarri from Napoli in a £57m move, as per Sky. The prospect of Zola and Sarri teaming up in the dugout is a tantalising prospect and some Chelsea fans couldn’t contain their exciting for the new season ahead, coupled with some entertaining football too. Chelsea appointed a chain-smoking ‘genius’ “Maurizio Sarri” as their new boss with club legend Gianfranco Zola as his assistant. Welcome home Maurizio Sarri and Gianfranco Zola! ?? Sarri and Zola… Champagne. Futbol. ?? ZOLA AND SARRI! DREAMTEAM! ???????? I’m happy with Sarri being appointed our new manager, I hope he can improve the squad and bring attacking football to Stamford Bridge? ?